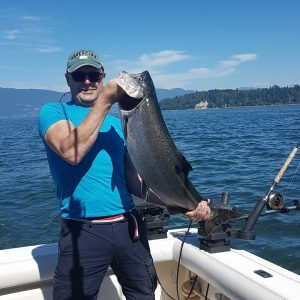 With winter taking longer to arrive this year, we’ve had some amazing weather to allow us to capitalize on the great fishing in the Vancouver area. We’ve been out a lot over the last month, primarily venturing into Howe Sound to the west side of Bowen Island. We have mainly fished Tunstall Bay, 3rd Marker and Hutt Island other great bets are Grace, further up Howe Sound Defense Islands and Porteau Cove or ventured around to English Bay. A key method for winter fishing is to drag the bottom. 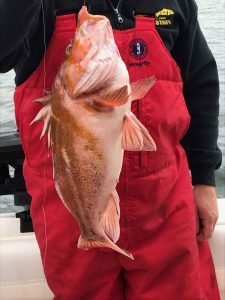 We’ve been successful getting a decent mix of legal Spring salmon, undersized salmon and the odd rock cod, lingcod and flounder which we release. We have had a lot of these days with a great mix of active fish. As far as gear goes, we’ve been using Gibbsdelta gear – Watermark flashers green, purple and blue and Rhys Davis the Herring Aide head with anchovies. We’ve been using the Skinnyg outfitter spoons, Irish cream or the Silver Horde Herring Aide and Irish Cream. Also adding to our success, there is a lot of feed around: herring and anchovies. If the feed stays, so will the fish! 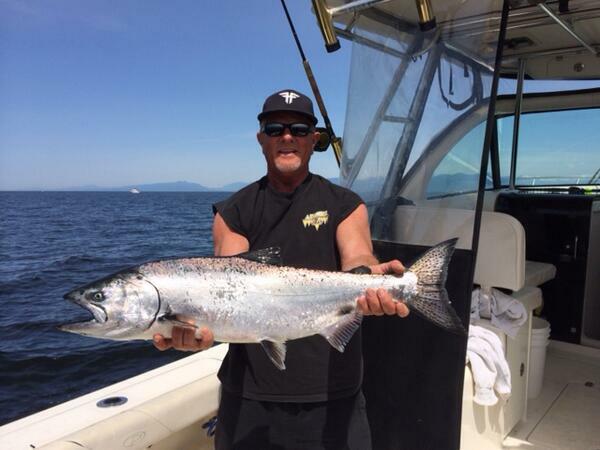 This could mean continued great fishing for the next few months in Vancouver! 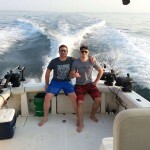 Generally on our charters we try to hit a low or a high tide so leaving early morning isn’t a necessity. Feel free to call us to ask about the daily reports, to book a charter over Christmas or if you’re looking for tips when venturing out on your own! 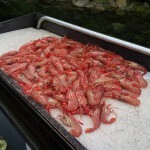 As a bonus for charters this time of year, we throw the prawn traps out to contribute to your seafood fest!! Well hard to say anything else except August and so far in September the fishing can’t get much better. 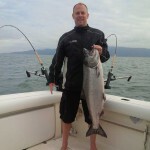 The Sockeye run off the Fraser was incredible as was the Coho fishing in English bay with a few Spring salmon mixed in. 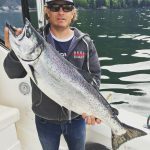 As i write this both fisheries are still good but will start to tail off soon and we will be switching over for our last real good fishery of returning fish on the West vancouver shoreline or on full day trips the South arm of the Fraser river can be an option. We have a few dates remaining in September and the start of October. For the West Vancouver fishery we only fish the flood tides as the fish get pushed toward the Capilano river so a lot of days it does not mean early mornings it is when the tide is right. This last fishery is keying on Spring, Coho and in later September the Chum salmon. To book a charter or ask questions feel free to give us a call and i can answer any questions you have and get you out on the right tide. 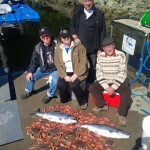 Enjoy the pictures of some of our happy charter customers over the last month with there catch. 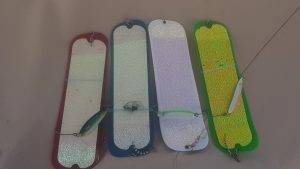 If you are thinking of trying to get them yourself the gear we use is Gibbsdelta flashers the Watermark white, blue or chartreuse, or the trusty reliable chartreuse glow and can’t wait to try the new herring aide flasher they should be great also. This fishery i mainly am a bait guy so using rhys davis heads with a 5 to 8ft leaders but some hootchies and spoons should work great also. The lineup that has worked this week. 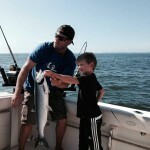 Summer in Vancouver has arrived and we’ve had some great fishing charters in the past week! 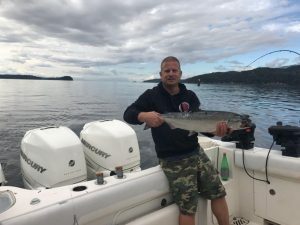 The Coho (Silver salmon) have shown up earlier than normal and in big numbers in the waters around Vancouver including: Bowen Island, English Bay, Strait of Georgia and Howe Sound.We’ve also had some nice Spring salmon (King salmon) mixed in which has resulted in days full of action! 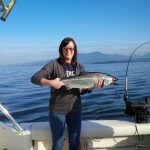 We have mainly been fishing the South/South West part of Bowen Island when calm winds allow. 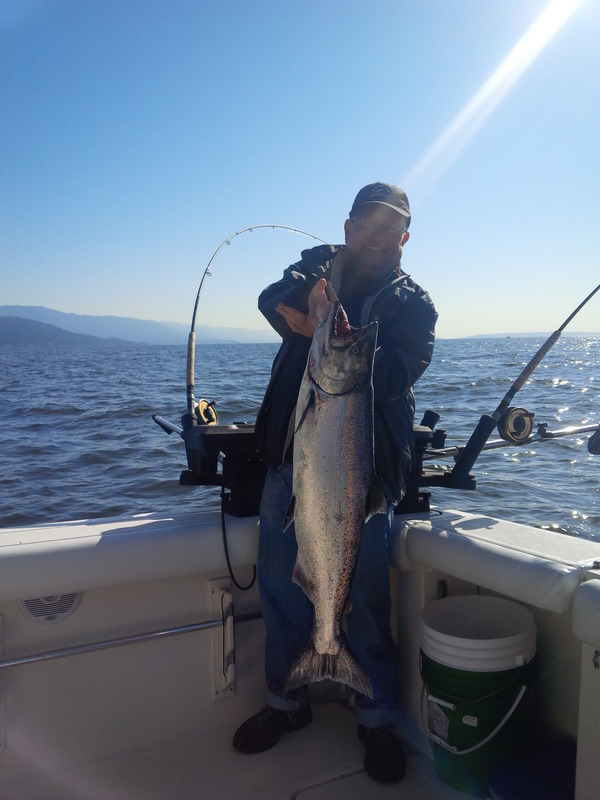 On windy days we’ve been looking for the Spring salmon (King salmon) close to Horseshoe Bay at Hole in the Wall (towards Lions Bay). 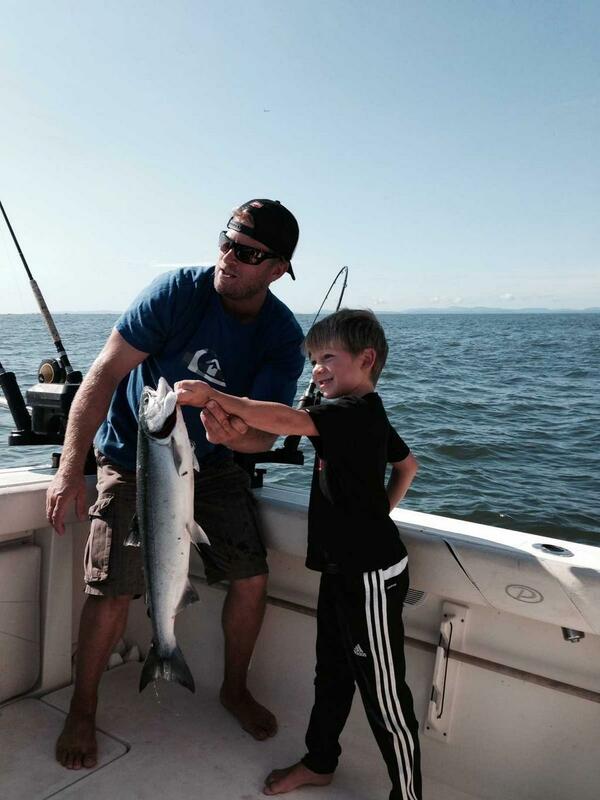 It’s a great time of year to book one of our 5 or 8 hour charters. We recommend an 8 hour to enable us to fish a whole tide. 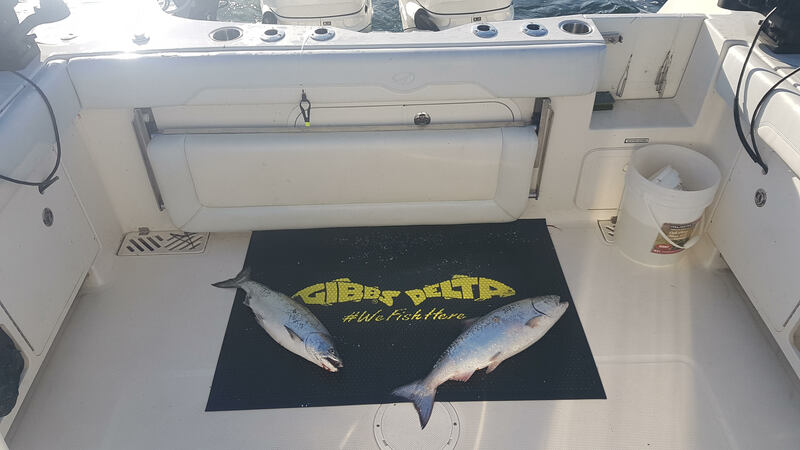 For those of you wanting to give it a try on your own, we have been using Gibbsdelta tackle: mainly the Watermark flashers with a white, green or red blade or a chartreuse glow flasher. Rhys Davis heads with smaller anchovies seem to be working great for both variety of salmon, Springs or Coho.We’ve also been using a few different Yamashita little squirt hootchies for the Coho (picture attached of gear).This fishing should continue to be great with all the bait (anchovy schools) around. 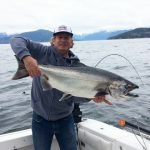 Looking toward August, the success should continue until we hopefully get a chance to fish for some Sockeye off the Fraser River.If that fishery doesn’t open, we are still in great shape with the Capilano Coho and the Springs returning to our rivers. 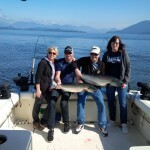 Feel free to call to book a charter or if you’re trying for yourself, ask a few questions. I’ll help any way I can. Until next time good luck let’s get out and enjoy a day. 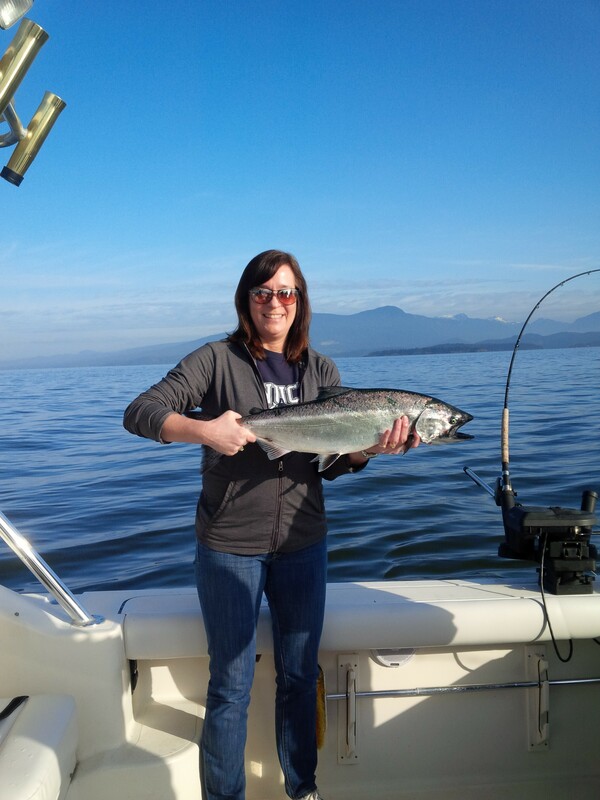 Beautiful Spring Salmon (King Salmon) to start the morning off. Having a break waiting for the next hit. 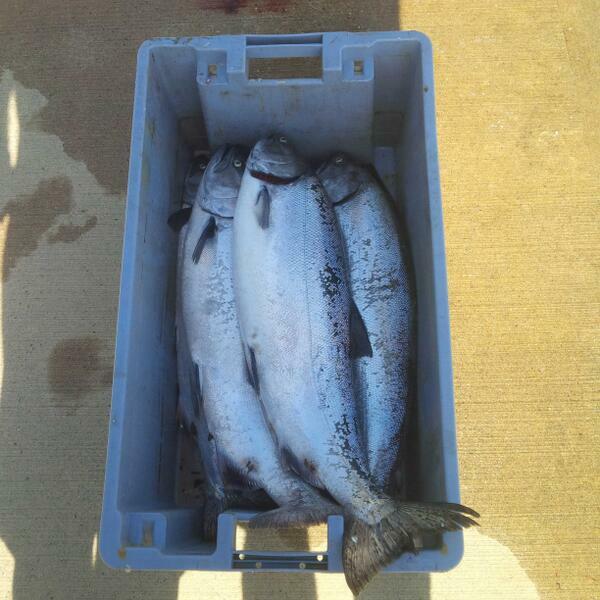 Two nice Springs (King Salmon) to start the day before the Coho showed up. It has been a while since my last fishing report. 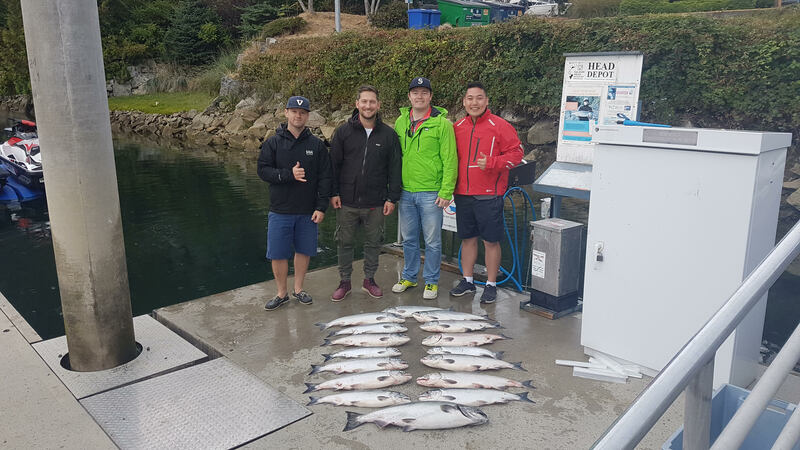 We have had some great Vancouver fishing charters the past month and it should continue till the end of September if the rains stay away. 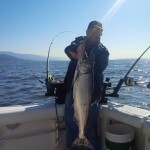 The Howe Sound pink fishery is now done so we are turning our focus to fish returning to the Fraser and Capilano Rivers. Right now, we’re mainly fishing off the Fraser River. 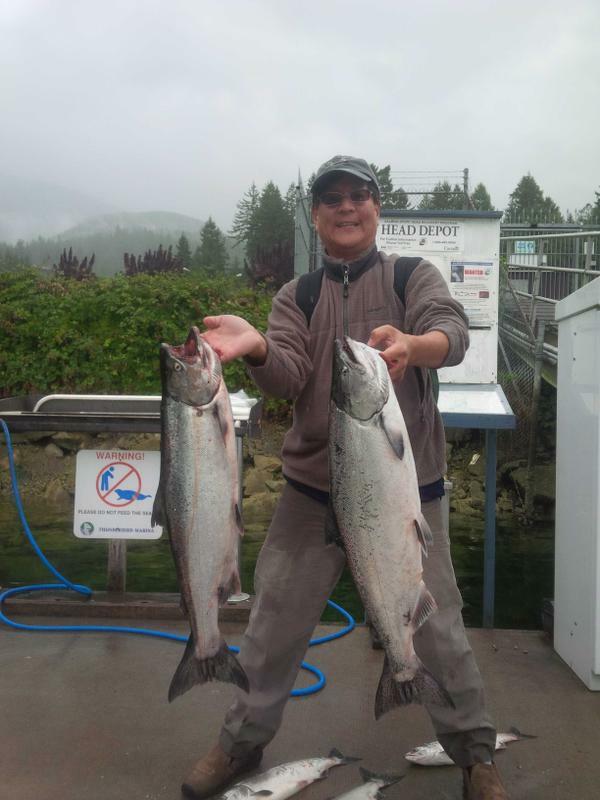 In the next week or so, the Capilano River should start to pick up again for the fall fishery. 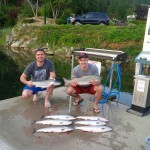 We’ve been successful lately with some great sized Springs mixed with a few Coho and Pink as well. 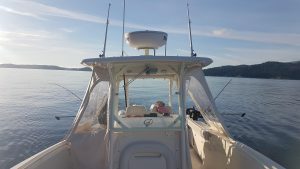 We are mainly fishing the Bell Buoy area to just South of the North arm, 30 to 80ft with Ryhs Davis heads and anchovies as well as Gibbsdelta Watermark flashers with the skinny g homeland security. 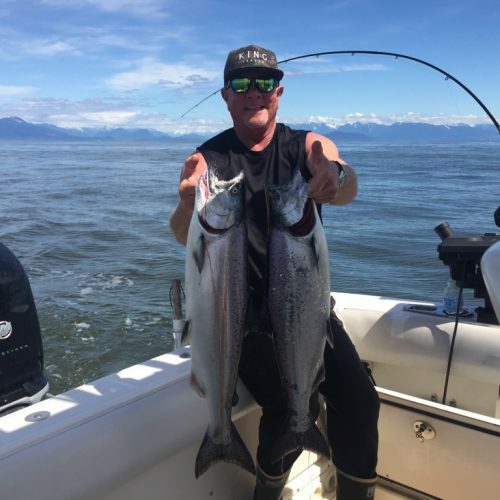 We have a few days available for charters for the Fraser River fishery as well as some days available later in September for the Capilano fishery which we only fish the flood tide. Call anytime for charter booking or to ask questions if you are going to try yourself. The rest of the year looks great. Come spend a day on the Watermark. Until next time good luck. With skiing over and what appears to be Spring finally making an appearance, it’s time to start hitting the water and kicking off an epic next 6 months! 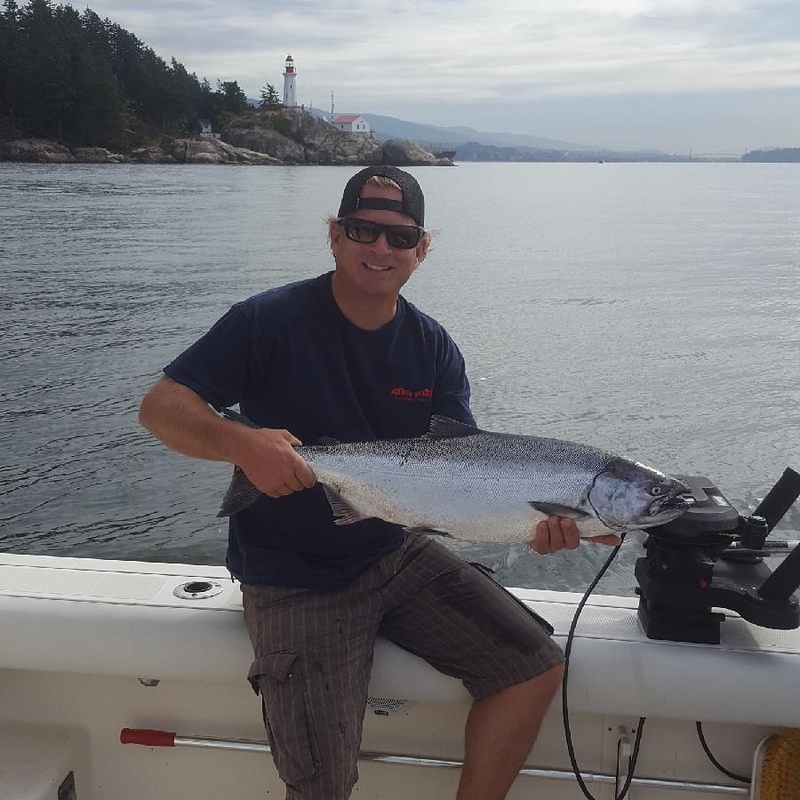 There has been some good fishing for the past month from the Gulf Islands, off the south end of Bowen Island and up into Howe Sound. 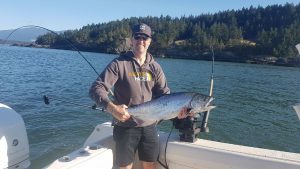 In the Gulf Islands at Thrasher Rock off Gabriola Island, fishing has been very good with the odd slow day to keep things interesting! 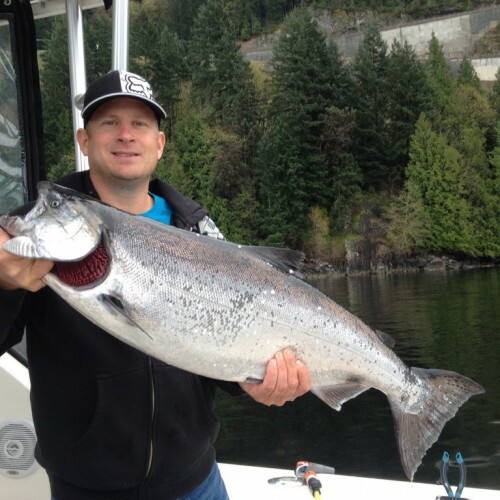 Most fish have been on the smaller side 8-12 lbs and caught between 120-200 feet. Beware, some days the algae has been terrible so check your lines often to keep them clean! On this side of the Straight of Georgia there are a lot of options: QA marker, South end of Bowen Island, Cowan’s Point, Salmon Rock and Hole in the Wall to name a few. Howe Sound seems to have a lot less algae so we’ve stayed local for the most part. It has been producing some nice fish up to 30+ lbs. Great to see at this time of year! 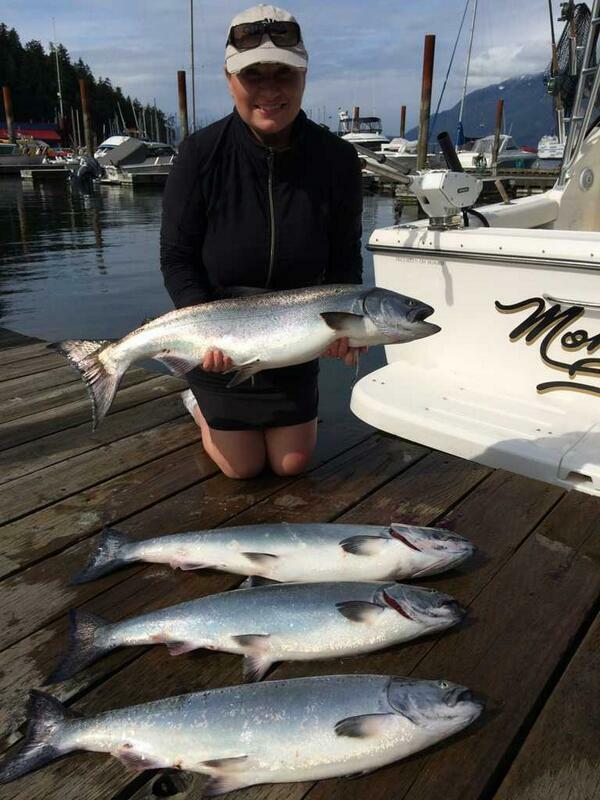 Fish have been showing up in abundance, not just size. We’ve hit our limit on a few occasions which obviously is great for any time of year! The feed at times is surfaced by the acre, you can feel your rods shake as you troll through. I try to locate the feed and stick close by. We’ve mostly been staying just north of Horseshoe Bay up 3 or 4 miles and fishing between 70-120 feet. 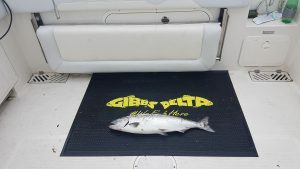 Gear we’ve been most consistent with has been Gibbsdelta. Flashers have been the Watermark green or purple blade or chartreuse glow. We’ve been using Skinny G spoons in Irish Cream or Outfitter and also the Silver Horde herring aide. The bigger fish have seemed to hit on Rhys Davis heads in green UV or 2 tone green glow. 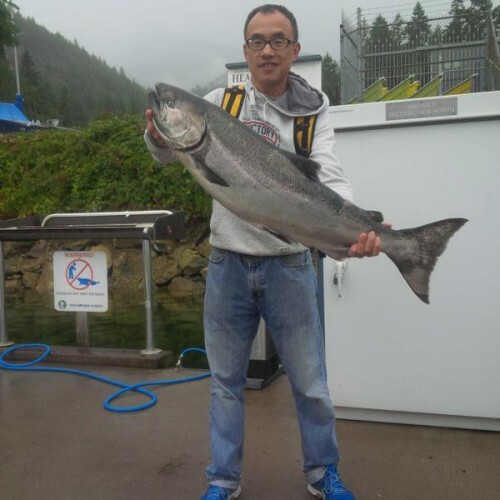 They haven’t hit huge numbers of fish, but they definitely attract the larger ones! 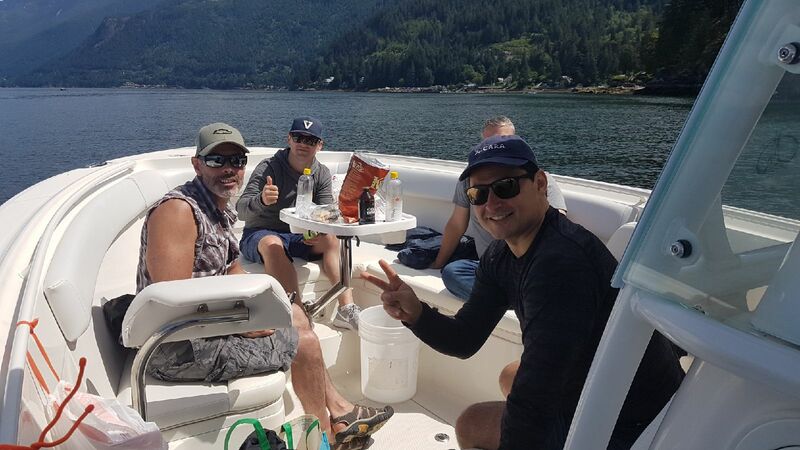 Hopefully this spring weather continues, the rain stops and the temperatures start to climb so we can enjoy the waters around beautiful Vancouver! Give me a call for charter information. At this time of year we recommend 6-8 hour local trips so we can fish a whole tide or move spots if required. If you’re looking to try your luck on your own, give me a call for some friendly tips and advice! Until next time, good luck! 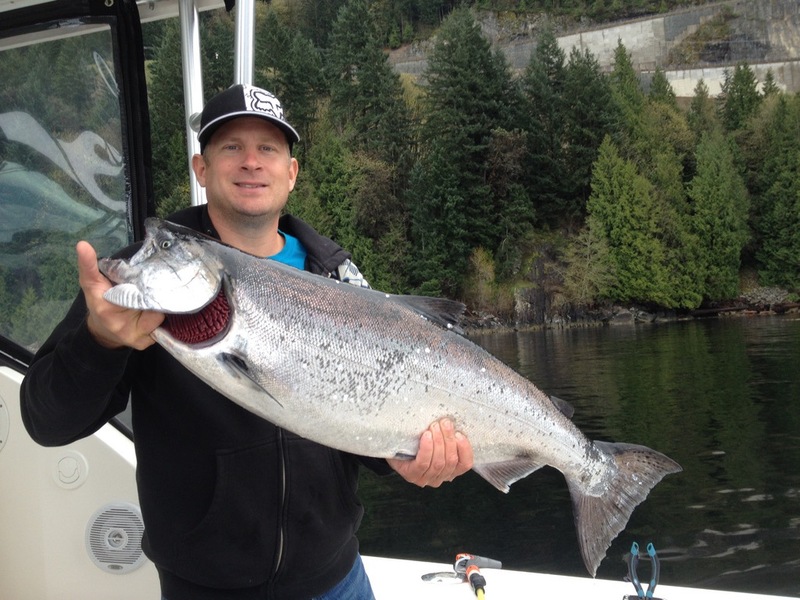 It’s been roughly another week in the vancouver salmon charter scene with great results all over. In the last week Howe Sound has really started see big numbers of Pinks showing up. Spin casting for them with Gibbs minnows has been dynamite in the 3 quarter ounce pink color. 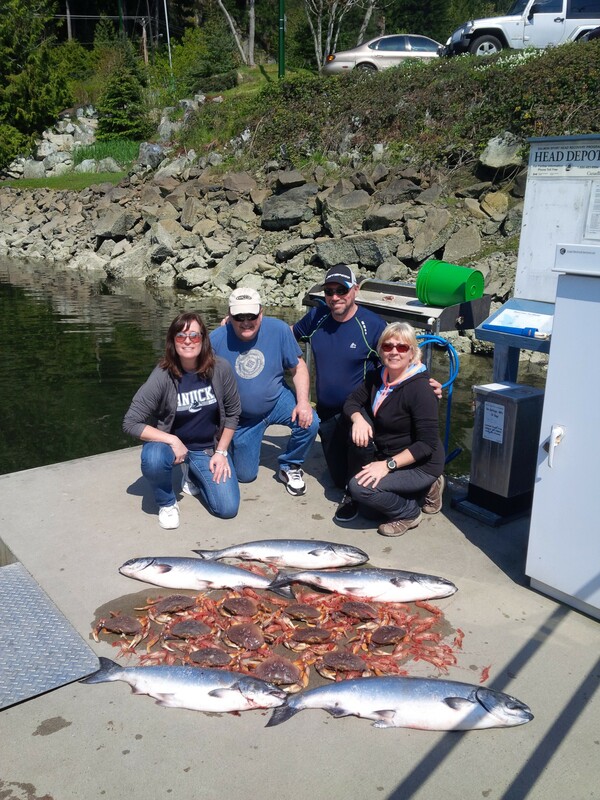 There are several areas to do this fishery off Furry Creek golf course and Porteau Cove. Keep an eye out when running, there are large schools heading up the shoreline. Stop and fish if you see Pinks finning or jumping! We have been keying on Potlatch which is an area just south of Defense Islands. It’s one of the most beautiful places we fish all year. If you like light tackle action this is a great fishery for you and it’s great for kids with so much activity. 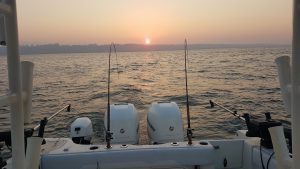 There are several other areas providing the chance of a great day on the water. In the last week Seal Rocks just off the West Vancouver shoreline has been on fire most days. 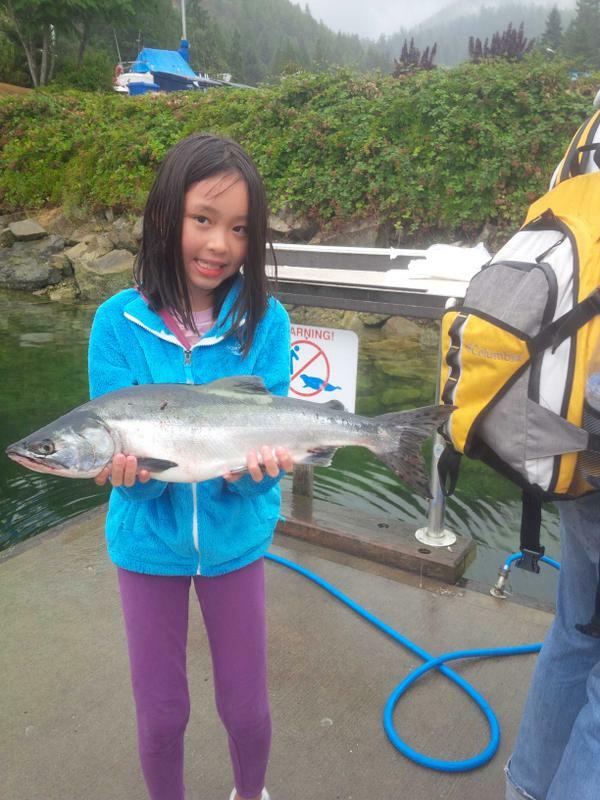 There has been massive schools of Pink salmon and most trips we have had a shot at some nice Springs. Other great trips have been off Point Atkinson (Lighthouse Park) toward Passage Island. 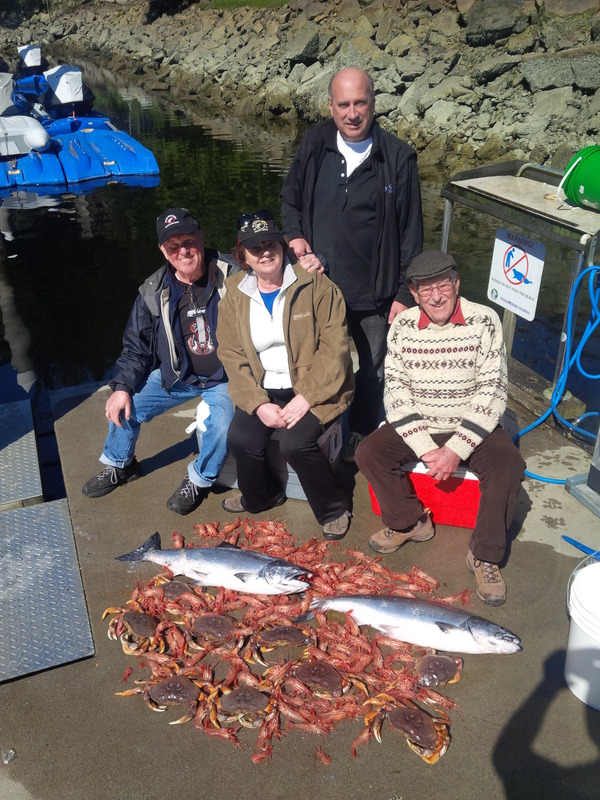 We have hit some real nice Springs with a mixture of Pink salmon and have even released some Sockeye salmon. Also seeing great results T10, Bell Buoy, and the West Vancouver shoreline near the mouth of the Capilano River. 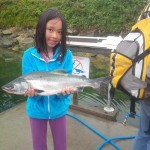 All have produced Pink salmon, a few Coho salmon and some nice Springs. In all these areas should continue to have great fishing for quite a while. 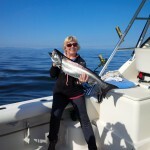 Call to ask questions or about our different fishing charter options. Feel free to call if you are trying to catch them yourself I have no problem helping you guys out any way I can. Until next time good luck. This week on the Vancouver fishing charter scene we’ve seen a mix of Coho, Spring and Pinks and some great results across the board! 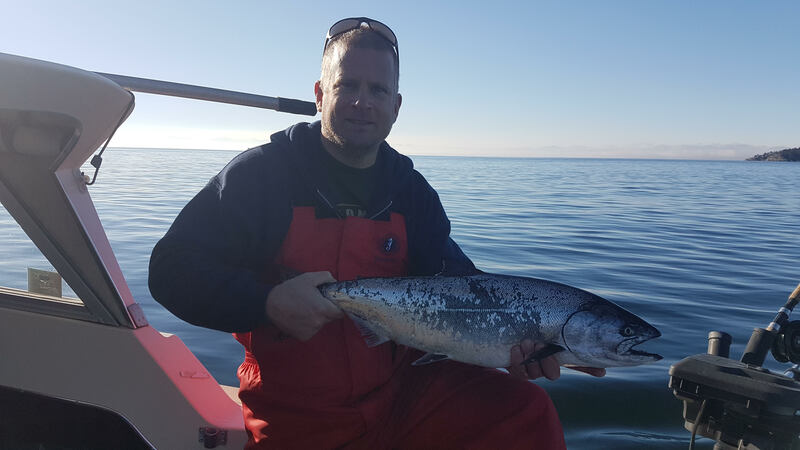 The Pink salmon have shown up in pretty big numbers with more showing up every day. 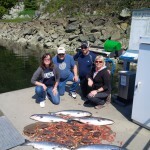 The shore casters up Howe Sound at Furry Creek have started to do well. The guys that have gone up Howe Sound have done very well wherever they find the schools from Potlatch to Furry Creek. We will start doing this in the next week if not sooner. 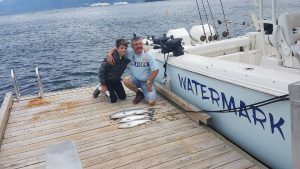 It’s a great fishery for young kids and people that like light tackle salmon fishing coupled with the scenery of Howe Sound you can’t beat it. 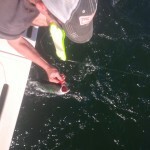 The tackle we use for thse pinks is spinning Rods with Gibbs minnow 3/4 ounze ‎pink jigs they drive the pink salmon nuts. All smiles after her first salmon ever, for a wet and rough day she was a champ. Reeled in a few of them herself. 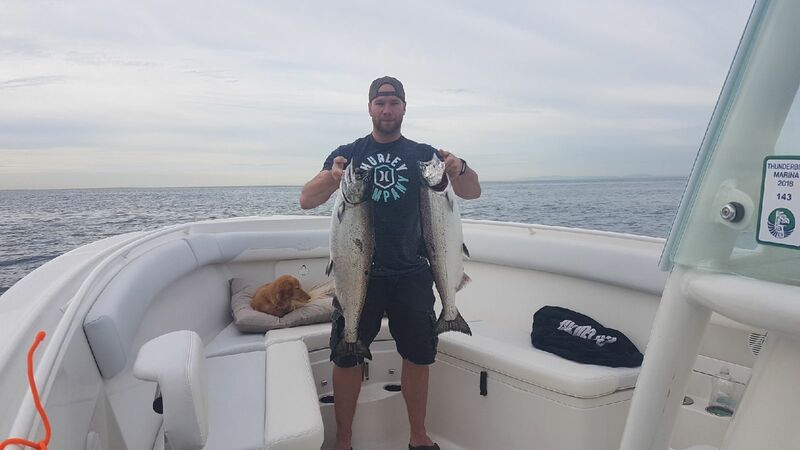 Great catch from morning charter. Kept 3 nice springs, lost 2, kept 5 pinks and lost a bunch. Real Nice Spring to start a morning charter, caught on gibbs watermark flasher and Rhys Davis head with an anchovie. 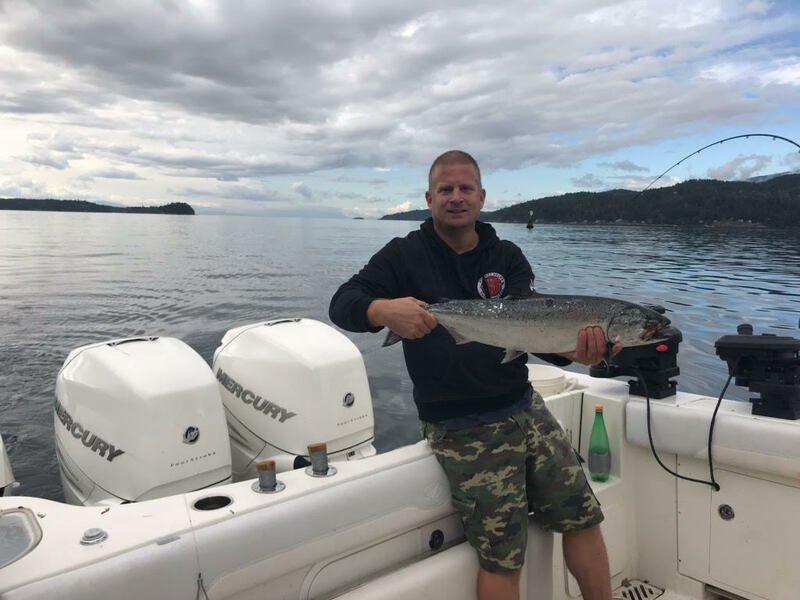 The West Vancouver shoreline has still been producing quite a good number of salmon; a mix of Coho, Pinks and a few Springs. 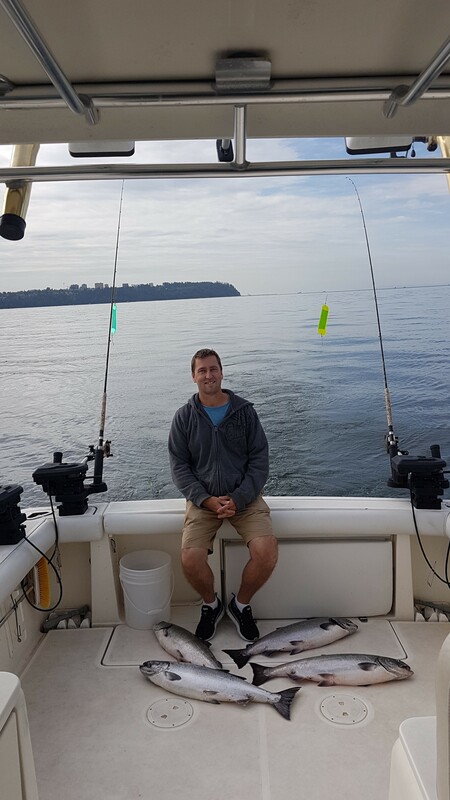 We have been fishing more off of Point Atkinson (Lighthouse Park) over to the QA Marker (Point Grey), to Cowans Point (Bowen Island). As you see in the pictures we have had great days on the water in the last few days. 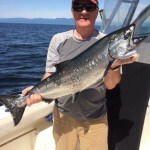 Other areas are good bets are Hole in the Wall just outside Horseshoe Bay, t10 off the middle arm of the Fraser River, and if you’d like a day trip the Gulf Islands off Gabriolla Island which have all had fish caught there in the last week. 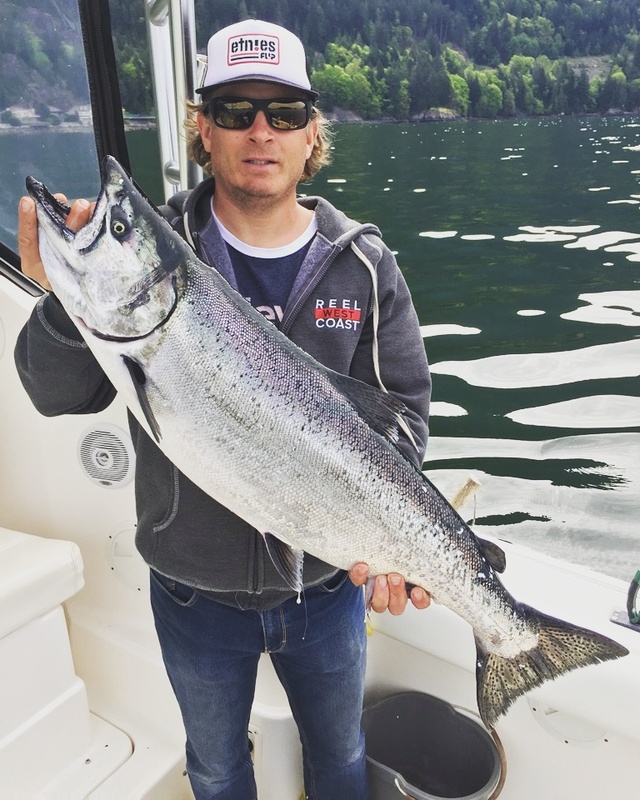 Back on the West Vancouver shoreline, we’ve landed a couple Springs weighing in the mid-twenties – big fish for this time of year! On one charter we kept 3 springs and lost 2 more. This fishery is fun for everyone. 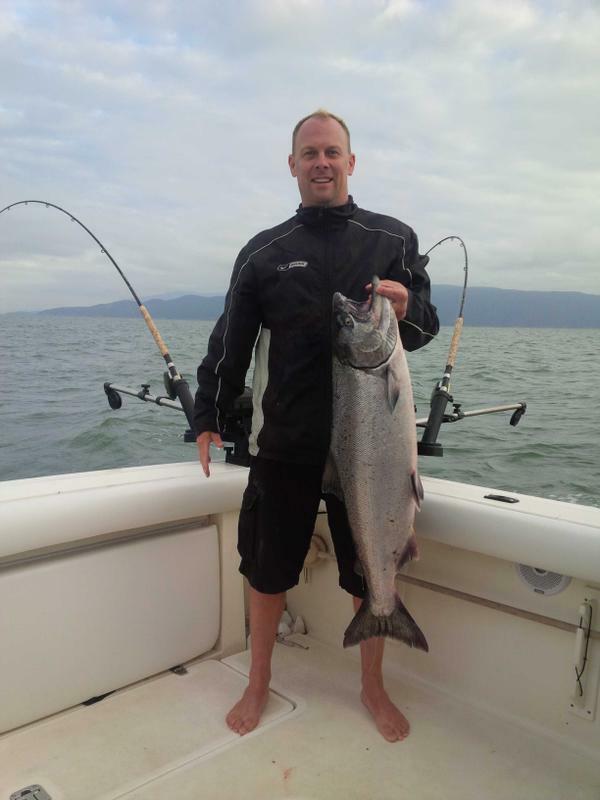 We stand a great chance at getting into a big Spring while catching Pinks or Coho salmon. The gear that has worked has been the Watermark flasher with Rhys Davis heads the two glow green one or the UV one with anchovies and a little Yamachita pink UV squirt hootchie has been great for Pinks. 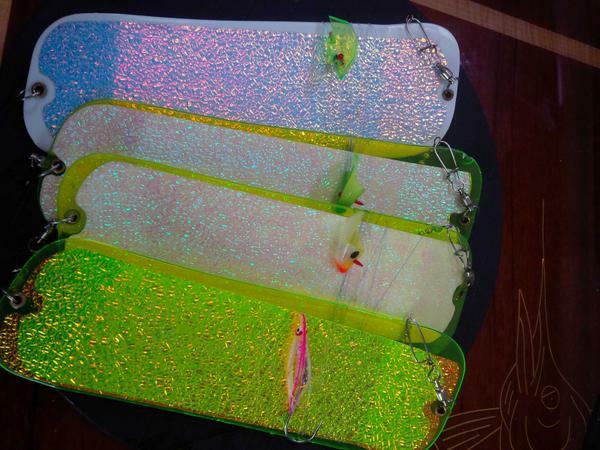 Gibbs watermark flashers or chartreuse glow with Rhys Davis heads and a yamashita pink uv squirt. 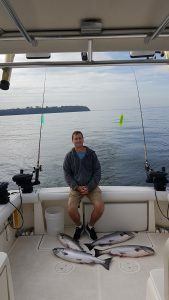 Call for info on the different fishing charters that we can do or call if you’d like to pick my brain if you are heading out yourself to try your luck and I can help you out. Until next time good luck! 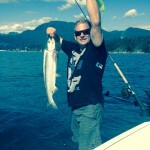 Another week of good fishing in the Vancouver area. The water hasn’t been cooperative in the past week so I haven’t been out at much as I’d like but when I’ve been out, we’ve seen some results. The other boats that have been braving the conditions and finding the patches of calm water have been garnering some great results. 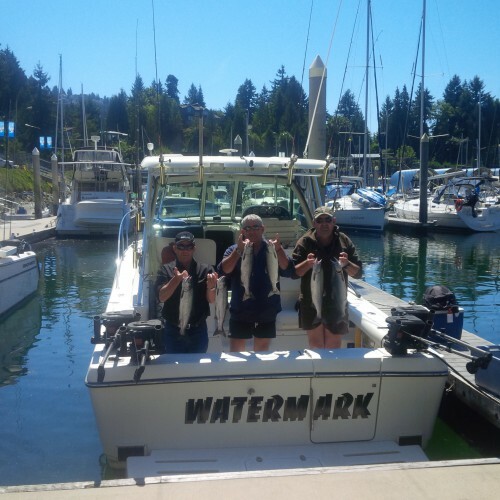 Watermark got out on Sunday for the North Shore Fish and Game Clubs fishing derby out of Thunderbird Marina. A big thank you to Derek Hardy for putting on another great day and of course thanks to all that helped with the event and donated prizes. There was a bit of a westerly blowing that day which made fishing a bit tough but we were fortunate enough to get some sun. We ended up placing 7th out of over 200 tickets sold! We kept one legal, lost 2 legals, released another 2 and got a good smack that didn’t stick. The cod are also out there and becoming a bit of a nuisance. We had to check our rods every 10 minutes and at one point every line had a cod on. We caught over 20 on Sunday! 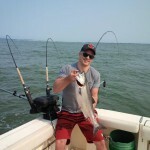 It’s tough to catch a salmon when you’re dragging cod around! Overall, it was a bit slow with the pressure of the derby and the full moon the night before but we were pretty pleased with our result nonetheless! The south end of Bowen Island is the place to be right now, weather dependent of course. The most successful gear hasn’t changed much in the past weeks. Anchovies with Rhys Davis heads working best with 6-8 foot leaders or the Silver Horde Homeland 3.5in with the same length leader is working well. I’m pretty much only using 2 flashers right now made by Gibbs Delta tackle – the Watermark or the Chartreuse Glow. In the next week or two the Gulf Islands will heat up. A few boats have started to see some results a bit north of Nanaimo, not far from Thrasher Rock and Gabriolla Island. 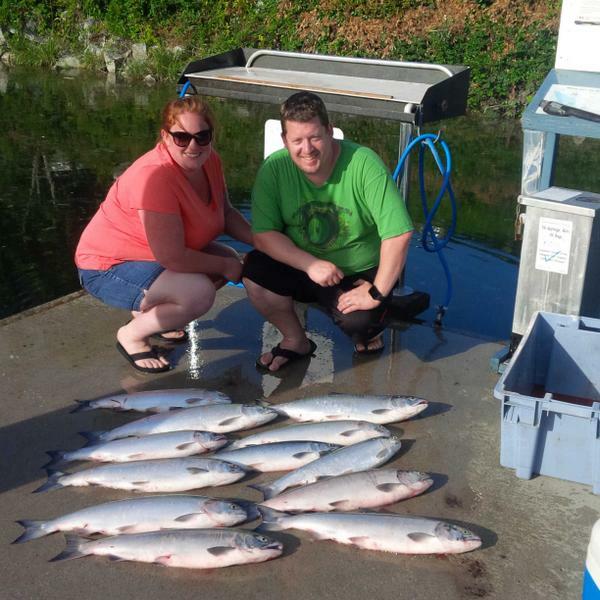 For these destinations we do full day trips and when it’s on, it’s lights out fishing within an hour of Vancouver. 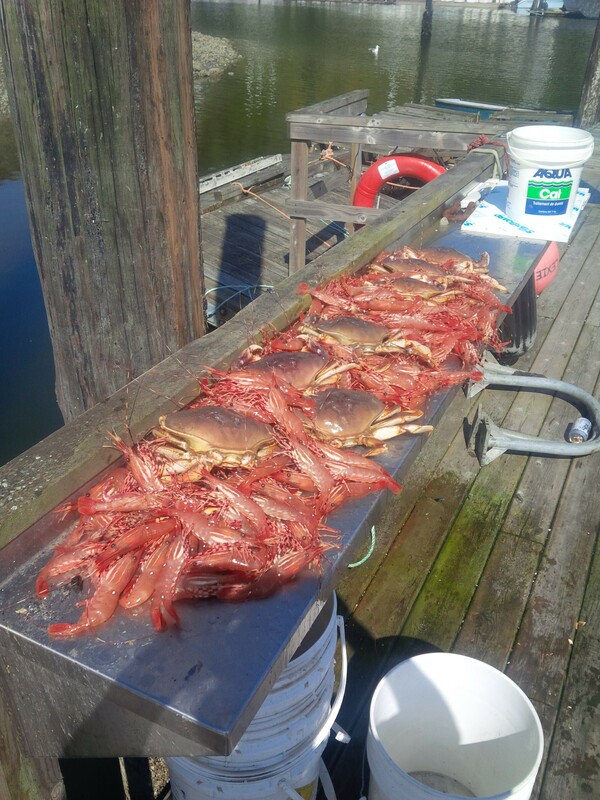 Crabbing and prawning is still very good. 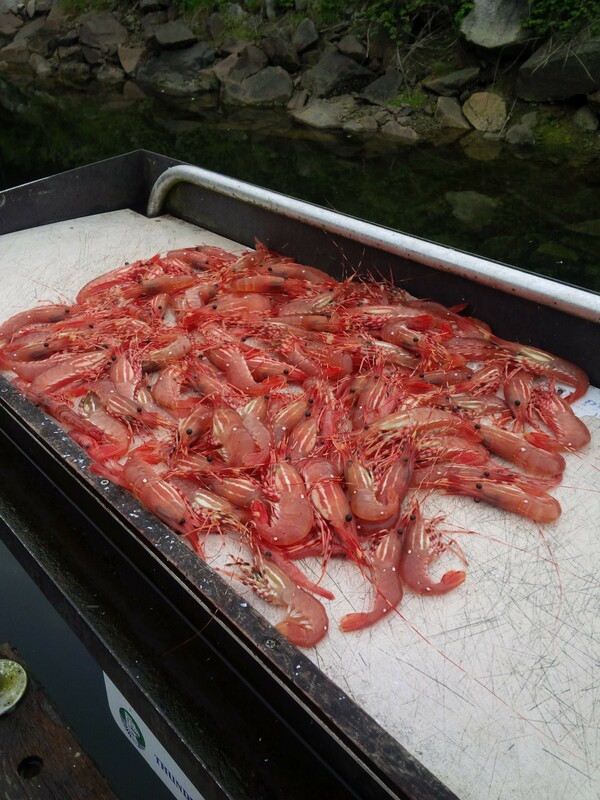 Prawning will be ending soon with the start of the commercial season. Soon if you don’t pull your traps from the water, someone else will do it for you! 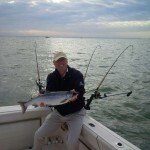 Now is a great time to book a charter for a local trip, there are lots of fish starting to migrate down the Straight. Until next time, call for more info or to chat strategy if you want to give it a shot on your own! It has been another good week on the Vancouver charter scene garnering great results not only on the Watermark but other boats as well. 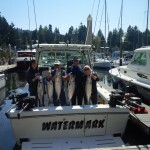 Most boats are now fishing somewhere off the south end of Bowen Island with good to great results most days. 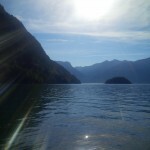 Areas also producing: the 3rd marker in Howe Sound, Hutt Island, Grace Island and Hole in the Wall. 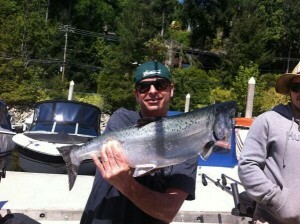 Keep an eye out for feed on the sounder, it’s usually a good bet that the Springs won’t be far away! This fishery should continue for another month. 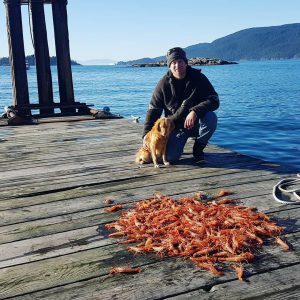 Over the next couple of weeks the Gulf Islands usually start to pick up and people start to migrate over towards Gabriola Island. Over the last week we’ve been successful with a bunch of different gear. 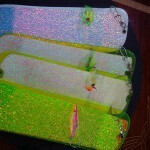 The flashers that have produced the best results this week are Gibbsdelta flashers, chartreuse glow, or the Watermark. Spoons: G force 3in Outfitter, 3.5 Bon Chovie and the Silver Horde 3in Homeland Security. On the Watermark we exclusively use Rhys Davis heads. The UV green or the two green flow work well with anchovies. Leaders for bait and spoons are most effective between 5 and 7 feet. 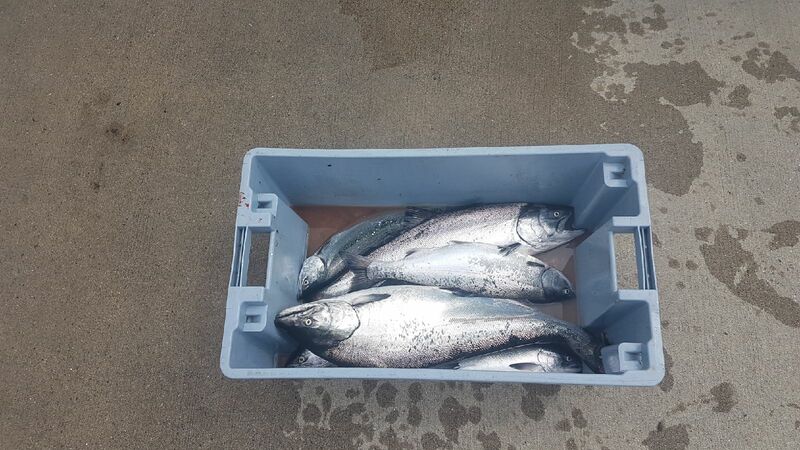 We’ve been averaging 6-12 hits each morning with salmon ranging from just undersized to up to 20 lbs. Some we’ve lost to play while a few just didn’t stick. 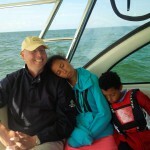 These pictures are from a charter this past week. 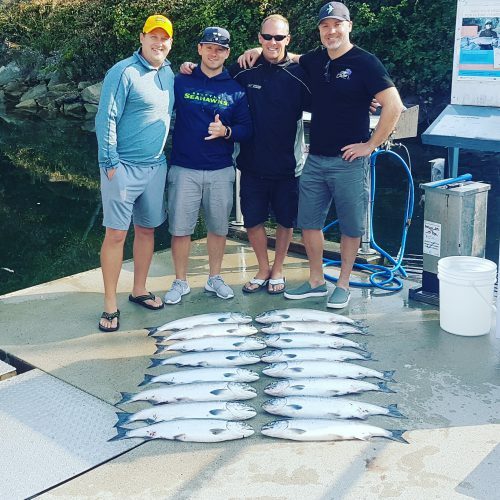 We had a fantastic morning and ended the day with 5 springs ranging anywhere from 14-20lbs, a few undersized, a couple hits and a few Pacific cod (more of a nuisance). To end the day, we had a great haul of crab and prawns. In addition to the great fishery, this past week we’ve been entertained by eagles, seals and were even lucky enough to see killer whales. A perfect ending to an already incredible day. It’s a great time of year to book a charter. The Straight of Georgia is always a great way to spend a day. In order to get the best experience and yield the best results, we’d recommend a charter 5-7 hours and beyond so we can catch both sides of the tide but have a full tide in to fish. If you have any questions feel free to call. I’d love to have you out on the Watermark but equally as happy to answer questions if you want to give it a go on your own! Enjoy the weather and until next time…good luck. 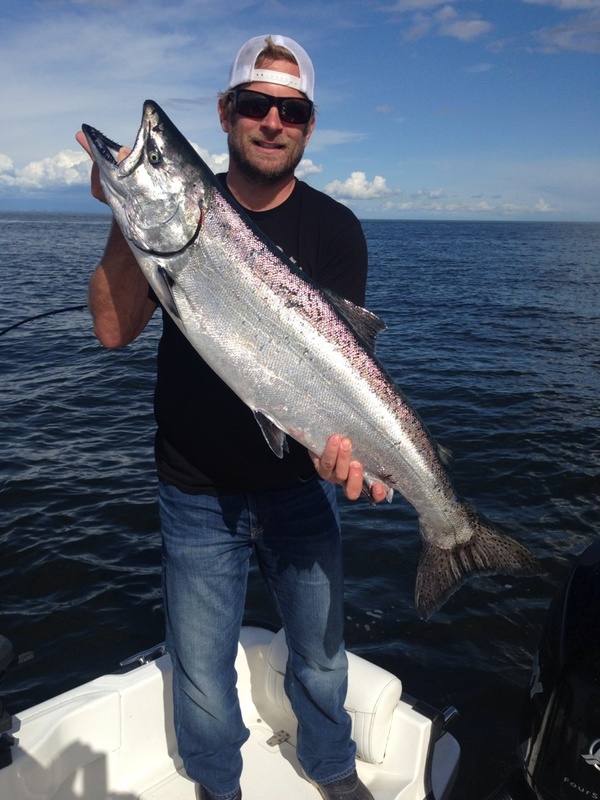 Another week has passed producing some good results on the Vancouver fishing charter scene. Defense Island is still generating good numbers with fish into the high teens and a few undersized. As long as the bait sticks around this area should continue to produce. 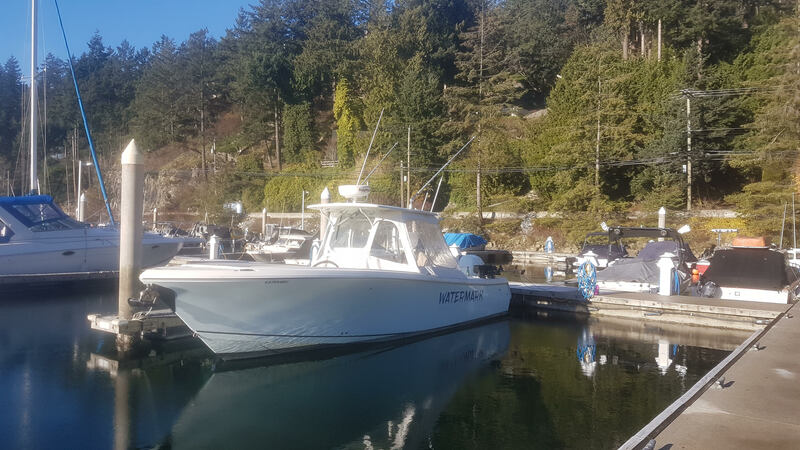 Alternate locations include Grace Island, 3rd marker on the west side of Bowen Island and as usual Hole in the Wall is always a good bet. We have now started to fish the south end of Bowen Island which will remain the main fishery for the next month or so and we should start to see a real pick up in the upcoming week. At the moment we are fishing anywhere off Cowan’s Point west. Most fish we catch tend to be in the 13-16lbs range which is great to see. The gear we have been most successful with this week has been the Gibbs Watermark flasher or chartreuse glow, Rhys Davis heads with anchovies. Also, G-Force 3.5in spoons or Silver Horde homeland security spoons. The best depths have been from 70-130 feet. Today Watermark had a terrific group out on a charter. Our lines were in around 7:45am off Slash. 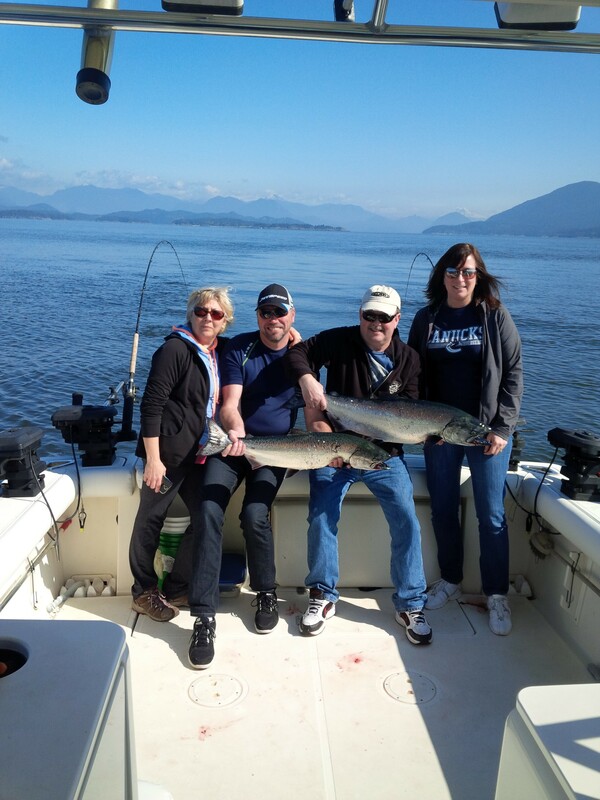 We had our first fish pretty quick – a nice 14-15lbs Spring. A great way to start the charter! Throughout the morning we got another about the same size, one slightly below the legal limit and one even smaller. We also had a good hit that didn’t stick…the one that got away! Slower numbers today but still finished with 2 in the box. We’ll blame it on the killer whales that came by and surprised us this morning! In 3 times out this week we’ve had between 4 and 9 hits for salmon and quite a few Pacific cod mixed in. The crabbing is good and the prawning is excellent. It’s a perfect time to book an April charter. If you have any questions about charters or if you’re just going out on your boat, feel free to call 604 816 8944 and I’d be happy to help any way I can. 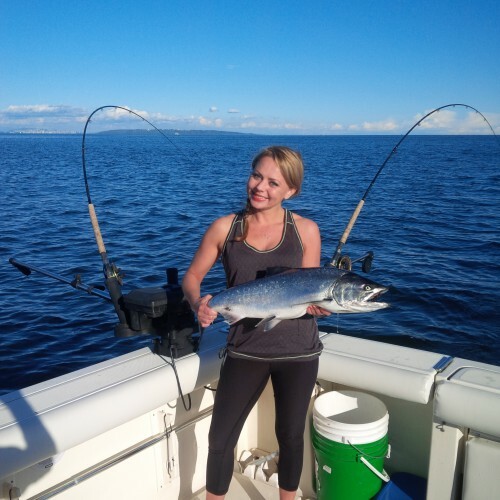 With the arrival of Spring in the Vancouver area, it’s fishing charter time! 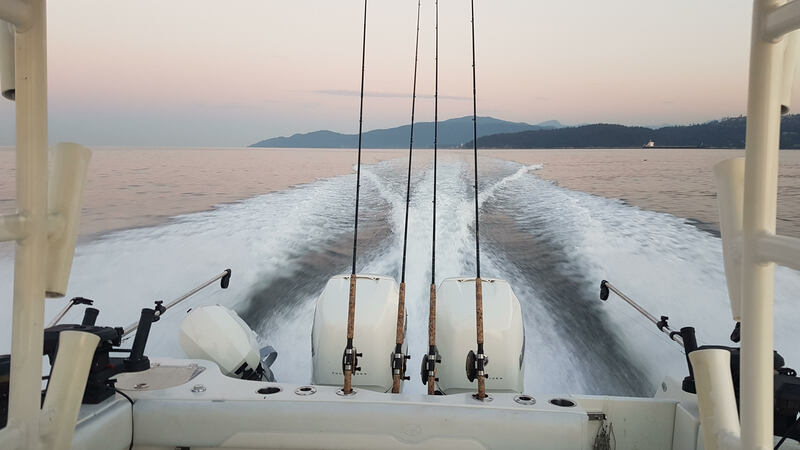 It’s time to start hitting the water in pursuit of the many different runs of salmon heading to the coast of British Columbia (specifically Vancouver and its vicinity) for the next 6 months. Last year was a banner charter season, one of the best in 20 years. 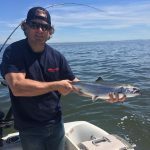 We saw record numbers of Sockeye salmon returning to the Fraser River in addition to other very strong runs in our river systems. This year we have seen plentiful bait in our area. 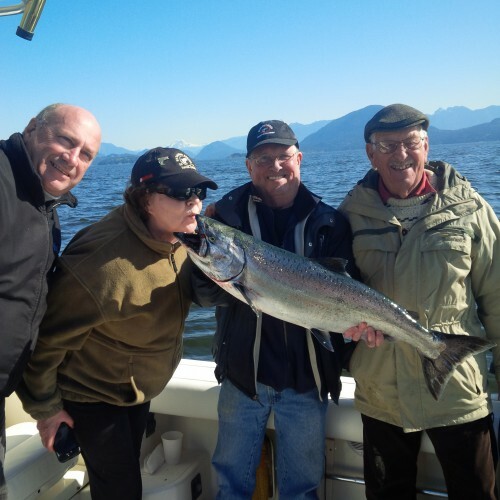 It looks like we will have another great fishery mid-April through June for Spring salmon fishing in Howe Sound. 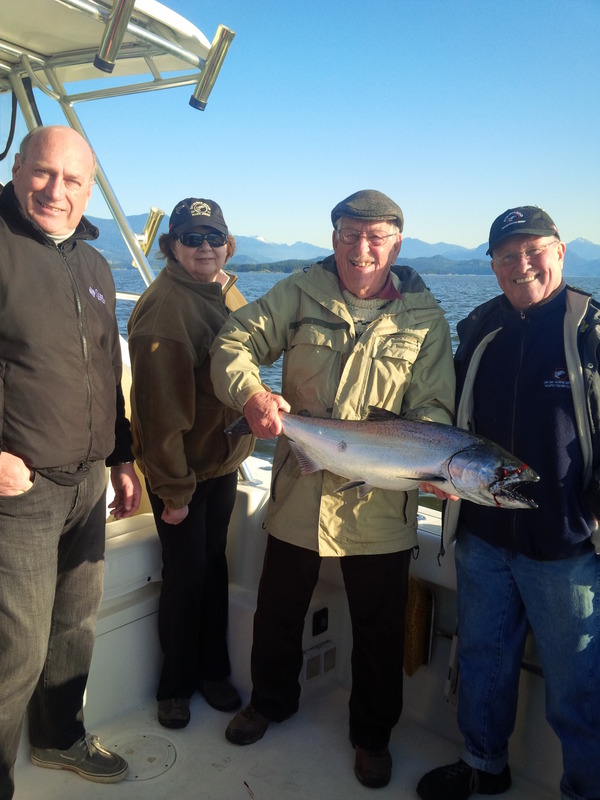 The south end of Bowen Island and the Gulf Islands are already showing promise to deliver excellent results. 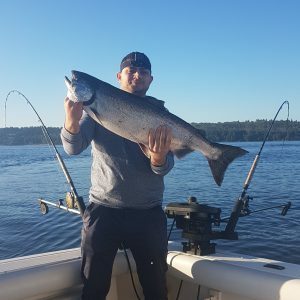 We are expecting a massive pink run, another strong Sockeye season and Coho and Spring fishing through to the end of September and if the weather remains dry, we have been known to fish all the way to Halloween. 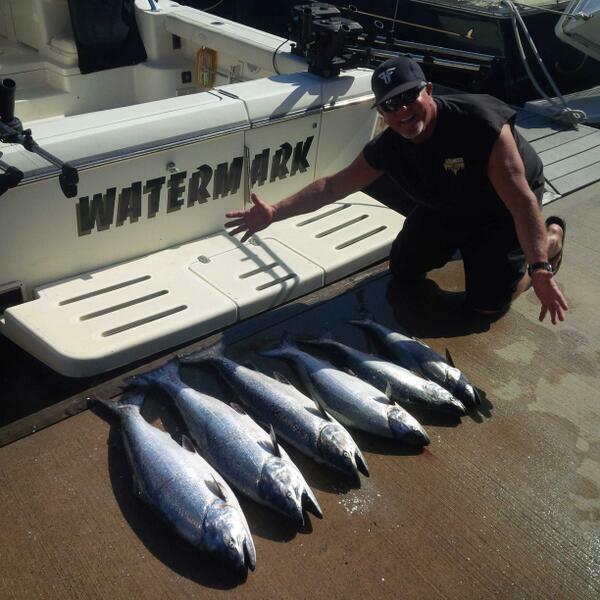 Watermark Charters finished it’s 2014 season with fish caught on October 10. A great way to end a great charter season! The Watermark is a 31’ Pursuit Express which is owner run to ensure quality every trip out on the water. 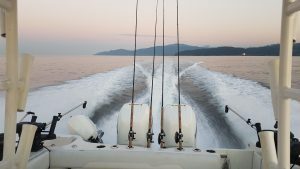 We leave from beautiful West Vancouver which is consistently one of the closest points to prime fishing grounds. 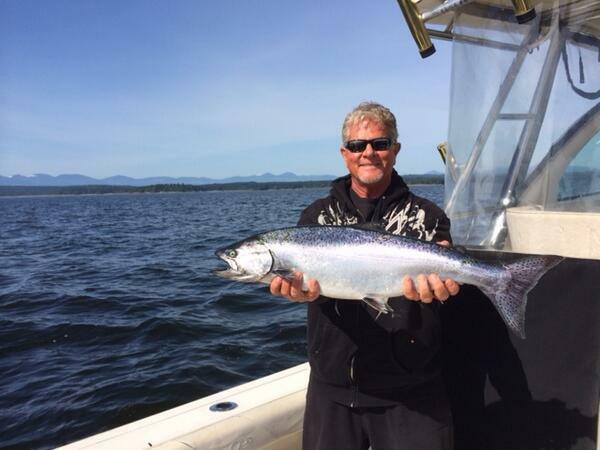 Why ride an extra 20 or 30 minutes when your lines can be in the water catching salmon? The Watermark will be kicking off its charter season in the next week. She’s cleaned up, tackle is ready, new cushions arriving shortly. All we need is the weather to start cooperating a bit more and she is ready to go! Equipment and amenities on the Watermark are high end and deliver the creature comforts to satisfy the most discerning customer. Last year the Watermark logged 80% repeat customers or referrals. 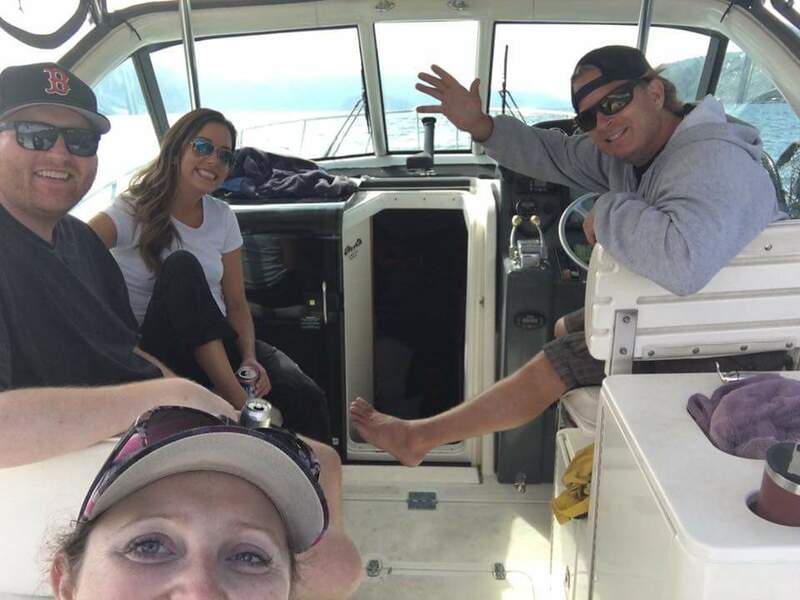 Watermark Charters strives for customer service excellence and this track record reinforces that people are enjoying their time on the water. Many of these customers have not only become repeats but friends. The fishing season is just starting to ramp up. So far this spring, there have been some great fishing days. With so much feed around, there have been more good days than bad. This inconsistency is normal for this time of year but we have seen some excellent results which leads us to believe we’re in for a great season. Many of our successes have been up Howe Sound – Defense Island, Hole in the Wall and Tunstall Bay on the west side of Bowen Island. In addition, the third marker off Hutt Island, Grace Island and Gambier have all begun to produce. 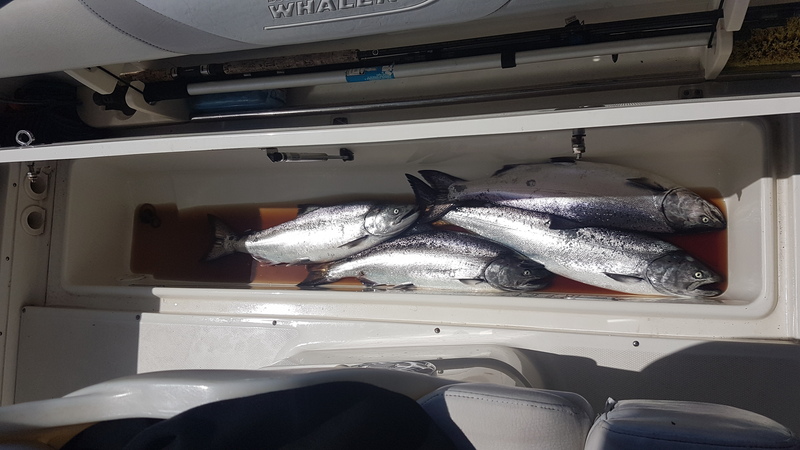 The largest confirmed catch to date has been a 24.5lb Spring off Hole in the Wall, luckly by me with friends on their boat. Others have come close in the high teens and low 20s, also large for this time of year. 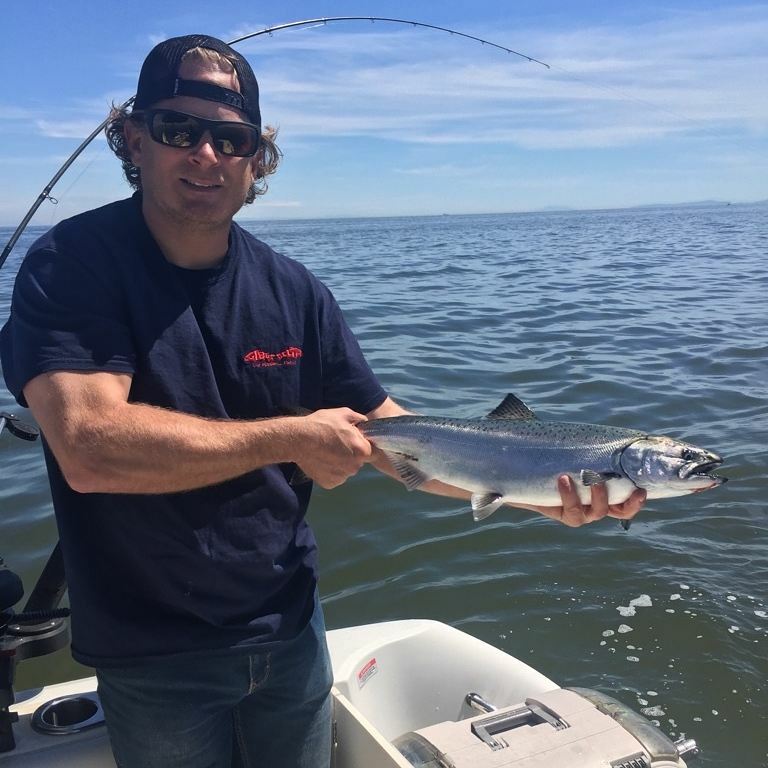 Most of these fish have been caught on Gibbsdelta G force spoons, Gibbsdelta flashers and as of late Rhys Davis heads with anchovies. It feels like an exciting season ahead! 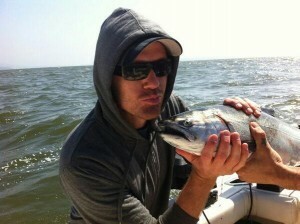 We will be publishing fishing reports more often when we start hitting the water consistently. For the fishermen out there, Gibbsdelta tackle has some great products to stock your tackle box. Some of my favourites are the Gforce spoon, Silver horde, Coho killer and Gypsy spoons. Flashers I exclusively use Gibbsdelta guide series flashers; a couple of my favourites are the Watermark and the chartreuse glow but I use far too many to list. Rhys Davis heads are my go to when using anchovies and herring. 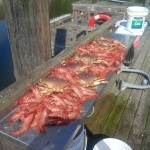 It’s also a great time of year for Dungeness Crab. 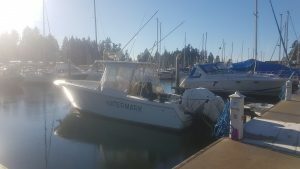 After a day on the water it’s great to check the crab traps and add a couple crabs to your catch at the end of your charter. It’s a great way to spend a day! Charters are starting to book up on the Watermark, beginning April 9. 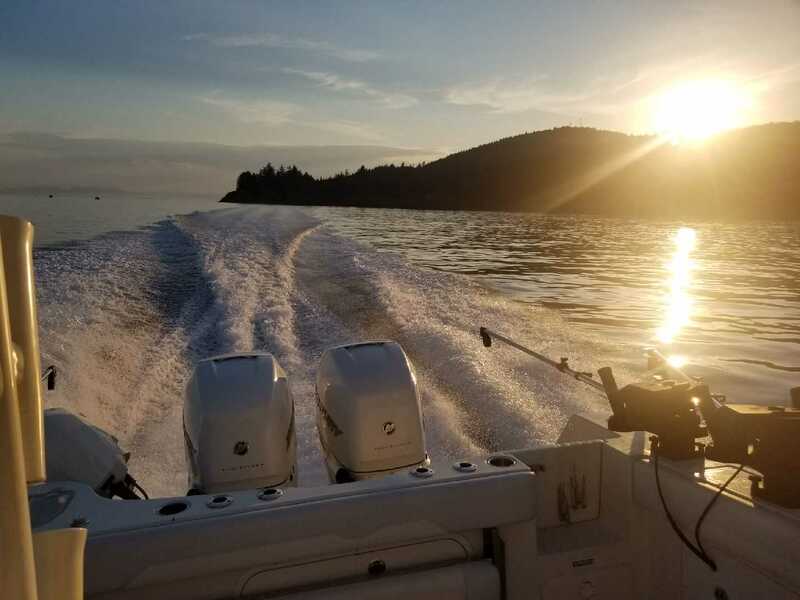 If interested in booking a charter or have general questions about lodging, restaurants and other amenities when not on the water please feel free to call or email anytime. Until next time, good luck and I look forward to hearing from you. It’s going to be a great season! 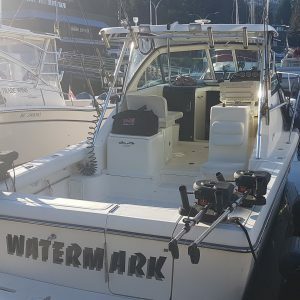 You can follow us on our webpage www.watermarkfishingcharters.com or on Facebook at WatermarkFishing Charters or on Twitter @salmoncharter for daily reports! 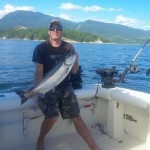 Give us a call 604.816.8944 for info and to book a charter. I am happy to help in any way I can. Google Glass Video of Sockeye Fishing in 1st person. Well the fishing has been great the last couple weeks with most days with limits getting hit. 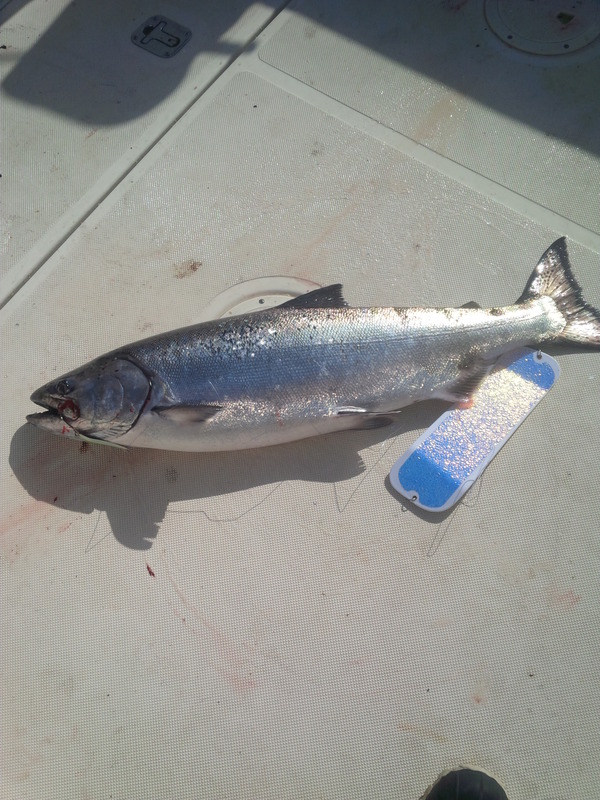 The Sockeye seem to be here now in full force and the odd Spring mixed in. 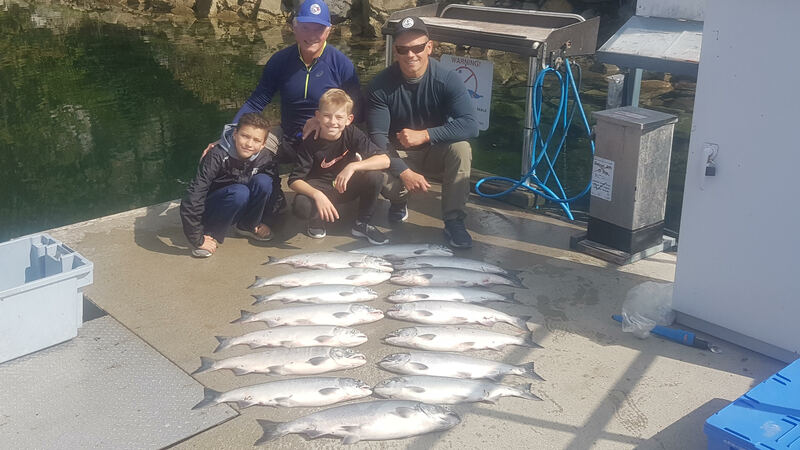 The charter season has been great so far, with this Sockeye run to still be fish, then we end the main part of the charter season with a great Spring run. 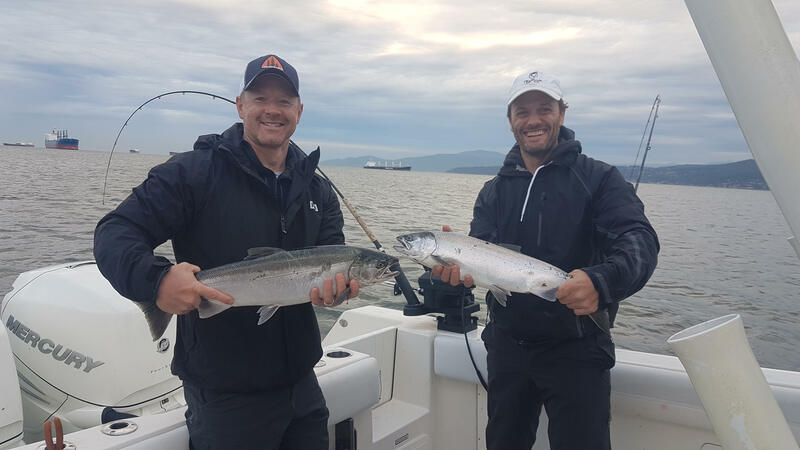 We fish two spots for these two separate Spring runs the West van shoreline for one, and off the Fraser river for the other one. 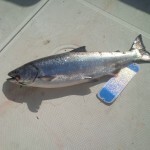 With how the Sockeye forcast looks we could be fishing them into mid September also. We have a few days left available in August and September we are starting to book up also. Call to book a charter and get the best days available. 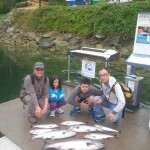 Family on their first salmon fishing charter, was a great success. His first salmon, almost as big as he was! 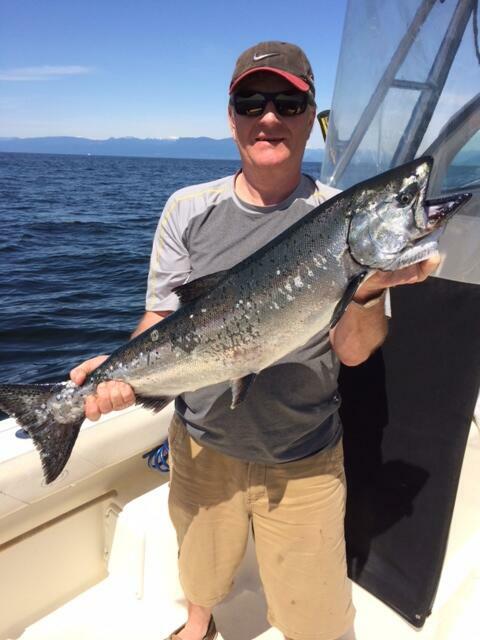 Fishing mainly off the Fraser river right now for Sockeye between the North arm and the South arm. 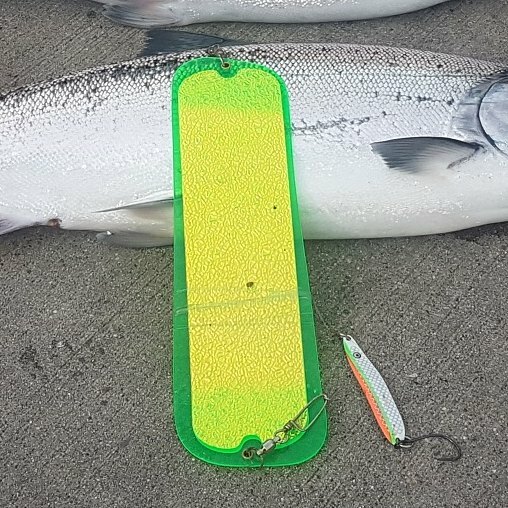 We have mainly been fishing the middle arm of the Fraser using Gibbs Highliner flashers with glow head, glow stripe pink hootchies seem to be best between 30 and 50ft. 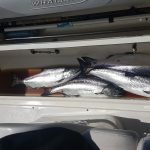 There will be more Springs showing up in the next week or so and we will start to try and key in on them on charters, for people who prefer to go for them. Anchovies behind a Gibbs flasher at 50 to 90ft seems to work well for them. If you have any questions feel free to call and ask I will help you out any way I can. Until the next report good luck. 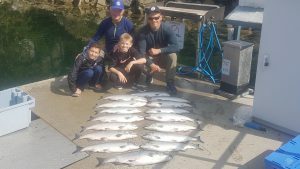 There current estimates are 70 million Sockeye this year, it looks like the run has just got started with charters limiting out all weekend. 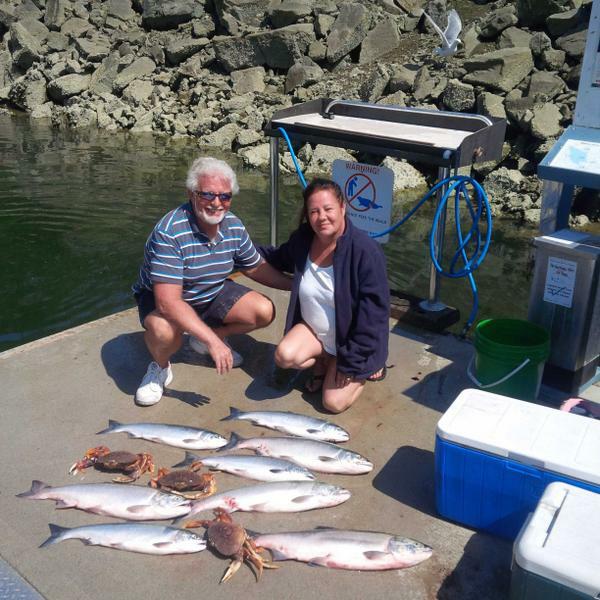 We have been fishing off the Vancouver International Airport – Frasier River, with great results. 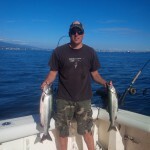 Another great week in the Vancouver salmon charter season. This week had a mixed bag but turned out to be great for us with limits of Spring salmon and with a surprising amount of Coho showing up here and there across the Strait of Georgia that we released. 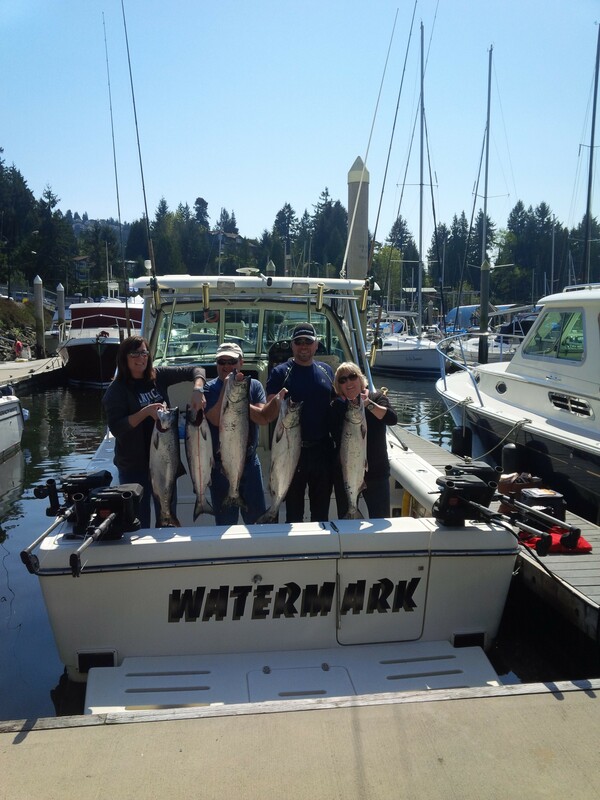 If you want to know what’s going on up to the minute follow @salmoncharter on twitter or like watermark fishing charters on Facebook. 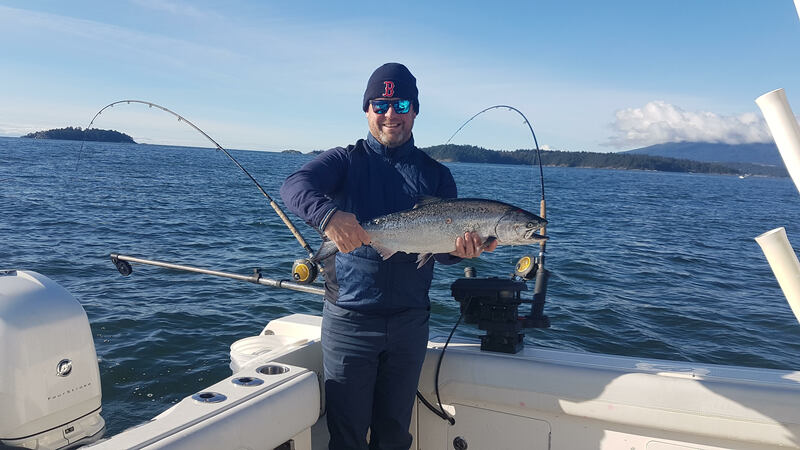 The Gulf islands were great again this week with lots of Springs and some days a lot of Coho which is a great sign to see them at this time of year. We mainly fished off Thrasher rock and the gear that works best was Gibbs Highliner flashers chartreuse glow. At the start of the week hotchies were best but in the last few days SilverHorde 3.5in spoons were the best and mainly Homeland security, Irish cream and the Kitchen sink rocked. 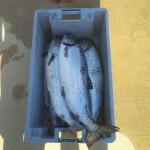 Check out my twitter to see pictures of the fish we were getting. This side of the straight there was some good fishing. 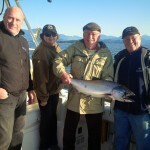 ‎ Today guys did well in Tunstal bay and throughout the week fish have been caught off the QA, point Atkinson, the south end of Bowen island, and a few at hole in the wall. 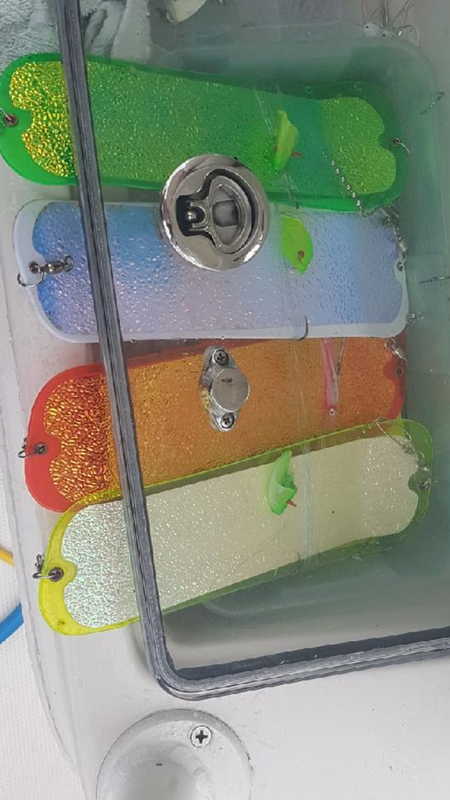 A mixture of spoons, hootchies and bait seem to be working best. 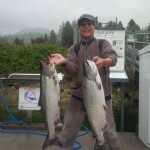 The Gulf Islands, across the strait, at Thrasher rock has been smoking most days with double digit fish getting hit. The weather is supposed to be calm and sunny all week so now is the time to book. 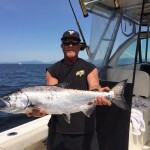 Vancouver salmon fishing report Easter Sunday 2014. 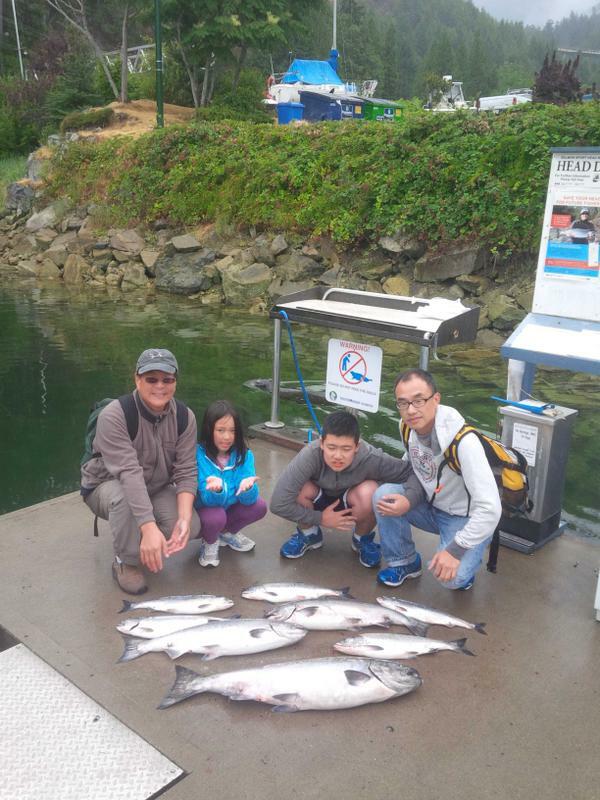 It’s been another good week for fishing charters in Vancouver. Some days have been nothing but excellent from the south end of Bowen island to across the straight to Gabriolla island and Thrasher rock. Across the Straight of Georgia at Thrasher rock and the Grande most days have been very good. Many days there have been limits with a few slower days mixed in. Look at my Facebook Watermark Fishing Charters pictures or my twitter feed on my website to see our weeks action. What worked best for us was Gibbs Highliner flashers with Silver Horde spoons between 100 to 180ft. The best sizes of spoons were the 3.5 and 4 inch ones with anywhere from a 5ft to 7ft leaders. The fish we got into we’re mainly 14 to 19lbs but there were a few real nice fish up to a beautiful 36lb one caught by a friend Brain. 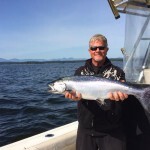 This trip is best done on a 9hr charter a great day in the Gulf islands. 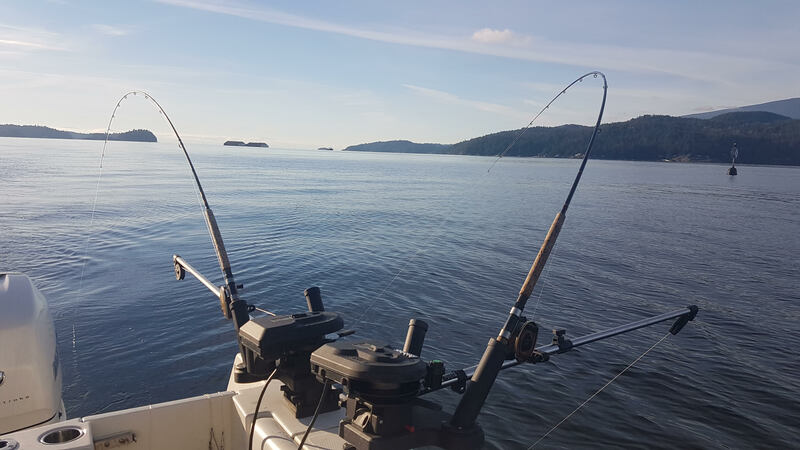 The south end of Bowen island has also been very good most days fishing anywhere from a mile off shore to 6 miles off shore. We’ve had some great days with most fish coming on Gibbs Highliner flashers fishing anchovies or spoons between 90 and 130ft. There have been some great fish caught with a few proven fish around 30lbs most our fish have been between 10 and 20 lbs. 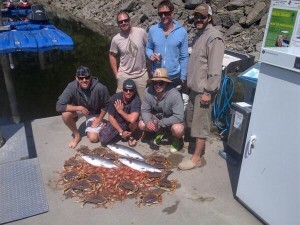 This is a great fishery to do a 5 or 6hr charter and it’s only a 10 to 15 min run from the marina. In the last week we have also fished in Howe sound on the West side of Bowen island at 3rd marker for a fishing derby and did quite well we were looking for the big one. We ended getting a 17lb and a smaller one that got us 4th and around 10th in the fishing derby we also has a chance at another one and released 2 undersized. 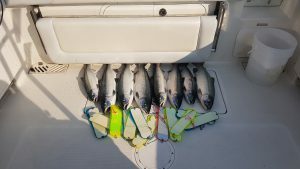 It’s always a good bet to try Howe sound and try and intercept fish going to the Squamish river or other fish passing through. 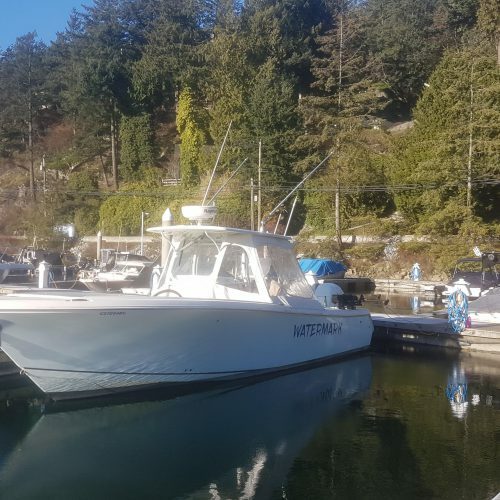 Other places that are worth a shot are Grace island, Porteau, Defence islands, Seymour bay, and Hole in the Wall near Horseshoe Bay. It’s a great time to get out with this weather and how good the fishing has been its a great time of year because you have more than one option when you go fishing. 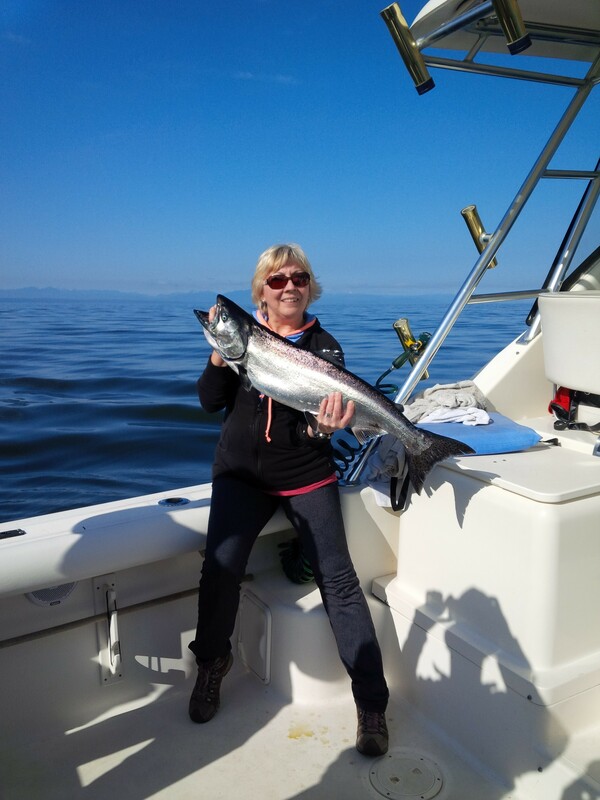 Call for more info about charters and if you’re coming up for a holiday feel free to ask what else there is to do in the greater Vancouver area and I will help you out any way I can. 604-816-8944 Mark. Until next time good luck and hope to hear from you soon.